These capsule wardrobe things are all the rage, aren’t they? I don’t consider myself terribly stylish. I try, and I’ve shared a few of my attempts at being fashionable in the past. My grandmother (mother’s mother) is the most stylish person in the entire family. There have been several occasions when we’ll show up at a gathering wearing the same item from the GAP or something. It’s crazy. And it usually looks better on her. Anyway, clothing. 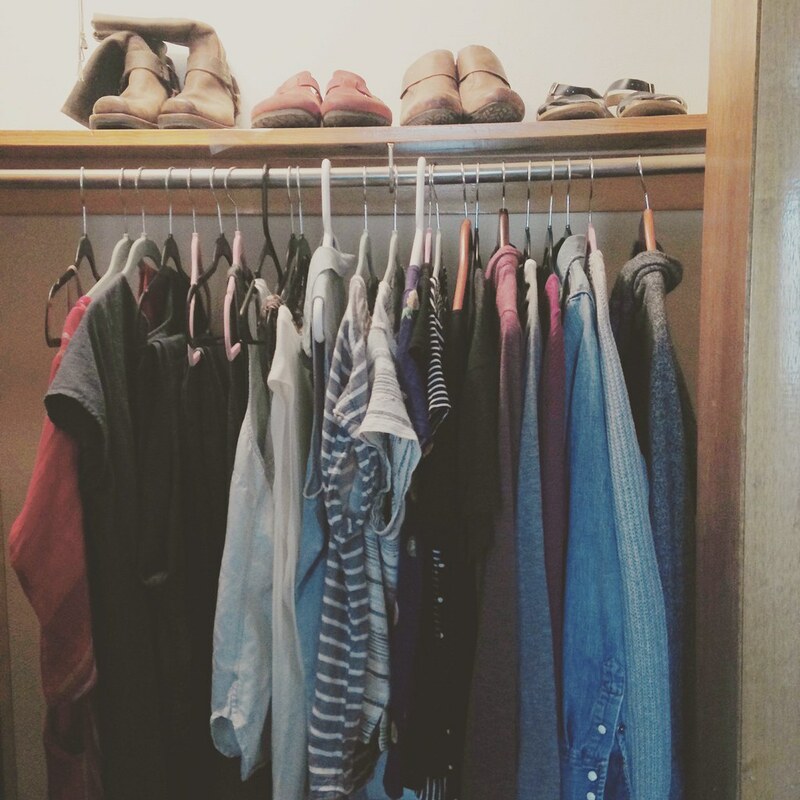 I tried weeding through my wardrobe in the past, but then we moved to our new house and I got my very own closet. Not just a closet, like, a DOUBLE. It’s huge, and I felt like I needed to have all my stuff out to fill it up. Plus, it’s hard right now, guys. I’ve been shifting between several sizes in the last couple years. Even until yesterday, I had some maternity pieces in my wardrobe because it seems like the minute I got the positive sign, stuff didn’t feel comfortable. Then there was that row of my old, old favorite jeans that just taunted me. I could barely pull most of them the full way up. Laundry is a whole other issue wrapped up in this mess. So, finally I got sick of mounds of clothing I needed to either wash or fold, and I said ENOUGH! To me, this whole capsule thing isn’t necessarily for style. Yes, it should make getting dressed in the morning slightly easier. Most of the clothes I kept (out of like 80 pieces total) were in the blue/grey/black/white range. I kept a few colorful pieces for when I’m feeling spirited. Otherwise, the rest went into storage (because I’ve already considerably pared down my clothing through donation and even ThredUp). I haven’t ironed out the final details yet (see what I did there? ), but I’d like to keep it all below 35 items. I also have 3 pairs of shoes/boots and 3 pairs of sandals. I’ll probably want to add shorts when the weather gets warmer. I’m not big on accessories, but I might find a few -- a belt, scarf, etc. We’ll see. But I’m hoping most to eliminate the mountains of laundry and to simplify my overall dressing routine. And getting all the too-small and maternity clothes out of the closet was just good for my soul. I’ll be back sometime in the near-ish future to share a few outfits from my closet. I’ll also update you on if this method is working for me. My immediate feeling is it’s going to be awesome. Oh, and (totally disjointed in my thoughts today!) I also have exercise clothing and lounge-wear that don’t count. I cut all that stuff in half too. Feels good! Do you do the whole capsule wardrobe thing?